are actually composed of 3 components: A tuner section, a Pre-amplifer section and a power amplifer section. In other words: a receiver is an integrated amplifer with a tuner. For selecting a receiver one might consider: how many inputs are needed, is a turntable input needed, how much output power and many pairs of speaekrs to be connected to it? How important is radio listening: AM and FM. Vintage analog reciever are quite a different experience form modern digital equipment in touch and feel, but also in terms of sound. In the 70's and earlier the "stereo" was one of the main attractions in the living room and nothing was spared to make the finest equipment with the goal to provide the best sound quality and ultimate listening experience. The more fidelty to the origiunal recording the better. Today's AV receivers are primarily the sound system for video sound. The goal: to provide audio for the visyual effects and so surround sound aimes to add audio effects to sound to furhter enhance the experience, which technically speaking is based on time delay between channels and reverberation - or in other words: something is added to sound that was not there before - which is the opposite of "fidelity"! Modern equipment is bsed on digital circuitry to switch and proces the audio signal. The lenghtens the audio's signal path, further taking away form fidelity. The result: an experience that first impresses with it's effects, but tires the listener out after the innitial excitement has passed. I hear the cry from many: "I want my old turntable, reciever and speakers back" Sound was remebered as warm, natural, inspiring. This was because: sound was pure, signal paths were short, and all circuitry used was analog. With this page I hope to bring your old tyme audio equipment back. Detain Features: FRONT Panel (top to bottom, left to right): Pwer switch, Center Level +/- Buttons, Rear Level +/- Buttons, Speaker Switches: Pair A, Pair B; Pro Logic indicator, C. Studio Indicator, Hall Indicator, Alpha Numeric Display Pannel, Master volume control, Tuning +/- Buttons, FM mode Button, FM button, AM button, Memory Button, Preset Tuning +/- Buttons, Numeric Butttons Direct button, Shift button, Input selector Buttons: Video, TV/DBS, Tape/MD, CD, Tuner, Phono; Effect/Delay time Button, Set-Up Button, 5.1/DVD input button, Mode button, Surround On/Off button, Bass boost button (+10 db @ 70 hz), Bass Control, Treble Control, Balance Control.  Output Power: Front 100W/Ch., Center 100W, Rear 50W/Ch. Description: This SONY is a surround sound receiver with digital signal processing and 5 channel amplifier. There are 6 inputs: 4 line level, 1 line level 5.1 input, and one Phono input. The built-in AM/FM tuner section is senstive with great specs, I'd say an extreme value for the money! Condition: Repaired, Tested in every detail, reliably working, except that a couple of the turner pre set buttons at times trigger the wrong pre-set. It sounds great! Physical condition: 9/10. Work performed to rework this unit: Repaired the center channel power amplifier and re-soldered many solder points on the main board for long termrelaibility. 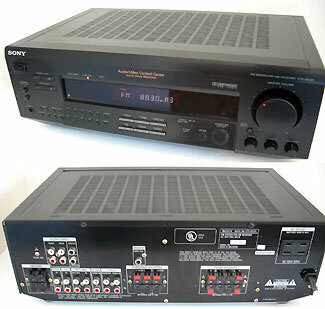 Lot: 1 SONY STR-SE581 HiFI Stereo receiver, as shown and as described above. The unit is remote controlable, but I do not have the remote - not included.  Output Power: 2 x 20W/RMS/Ch. Features (Detail): REAR: Inputs: Phono (1x Magnetic 1 x Ceramic); AUX , Tape Inputs ( monitor) Outputs: tape recording outpus, push terminals for 2 pairs of speakers, 1/4" Headphone Output (fornt panel), 2 AC power outlet: 1 x switched 1 x unswitched). Resetables speaker fuses for each channel. FRONT (top to bottom, left to right): Tuning Signal Strenght Meter, FM tuning Center Meter, FM stereo indicator lamp, Tuner scale. Bottom row: Power switch, Head Phone Jack, Push buttons for (top left to right, botom left to right): Speaker 1 Speaker 2, FM Muting, Low Filter; Tape Monitor, Mono Mode, Loudness, Hi-filter; Balance Control, Volume COntrol, Bass + Trebble controls, function selectro knob: AM, FM , FM-Stereo. Phono, aux Tuning knob. Description: This receiver was made for Mont Gommery Wards in Taiwan, but is still a quality piece of equipment. This is an old scool anlog receiver, probably form about 1977. It features Magnetic and ceramic phono input and offer to be used as a pre-amp or a s a power amp as jacks for that are provided. It works well and sounds great. It has all one needs and more in a stereo receiver. Condition: Repaired, then Reworked, Tested in every detail, fully and in duration: reliably working. It sounds great! Physical condition: 9/10 (only few minor signs of age and use) - overall appearance: exceelent / near mint. Work performed to rework this unit: Treated all controls contacts and switches including the tuning capacitor with quality chemicals. Re-soldered aged solder points throughout the entire unit, Lubricated meachical parts. Full functional test = good. Physical cleaning and detail work. Lot: 1 Wards Model 250 HiFI Stereo receiver, as shown and as described above.  Output Power: 2 x 20W/Ch. Description: This was made in Japan and sold under the Transaudio brand. This is an old scool anlog receiver, probably form about 1978. It is kept simple, yet a quality piece of equipment that works well and sounds great. It has all one needs in a stereo receiver: Phono input for turntable hook-up, tape input with recording output, AUX input for any line level device, (such as iPod, computer audio, etc. ), a well working tuner and a good sounding amplifier section. Just ot mention: the radio dial pointer is lit up yellow, and when an FM stereo signal received, changes the dial pointer light to red. Condition: Repaired, then Reworked, Tested in every detail, fully and in duration: reliably working. It sounds great! Physical condition: 7/10 (age related typical dents and scratches) - overall appearance: good! Work performed to rework this unit: replaced needed scale lamps, replaced the dial indicator/stereo lamps (upgraded with LEDs), repaired the stereo decoder, replaced aged capacitors in the stereo decoder circuit, re-soldered aged solder points throughout the entire unit, restored all controls contacts and switches including the tuning capacitor with quality chemicals. Lubricated meachical parts. Full functional test = good. Physical cleaning and detail work (About a $200 job). Lot: 1 Transaudio 6400 HiFI Stereo receiver, as shown and as described above. Description: This receiver is only 10 1/2" wide, 2 1/2" high and 7 1/2" deep. For that it provides all useful feturs: 2 Audio inputs, including phono for turtnable hook-up and a recording output to record form tuner or phono. A FM stereo / AM tuner built-in which receives fairly well. Ouput power is probably 2 x 5 W RMS which is plenty for a good amount of volume. Sounds good. Condition: Reworked, Tested in every detail, fully and reliably working. It sounds great! Physical condition: 9/10. Lot: 1 Realistic STA-19 Stereo receiver, as shown and as described above. Price: $95.00 or $115.00 with a pair of speakers. Please indicate whihc you want. 2-7 Weeks Lead Time - Price Range: Fully restorred typically: $250-$850. The goal with my work: to bring these receivers back to fully working condition. This takes hours and hours and HOURS of paistaking detail orineted work. Thus prices based on the amount of time and parts needed (some are quite hard to find! - which again takes time!) to achieve this goal. Shop time to refurbish equipment to order (applies to ALL units shown in this section!) is in SHORT SUPPLY, so I may not be able to serve you very quickly, especially during late fall, winter and the first two months of the of the new year. Rushing it and vintage audio equipment, or pushing for "discount prices" DO NOT GO TOGETHER! It takes as much time as it takes. If needing to rush: Please buy "AS-IS". Inquire for Details and larger Images --> Please refer to item nubers and type of unit listed in picture ! EXAMPLE: "Stereo Receiver # 63 " . Excuse the photos: they show the items as found and with defects. When refubished these items will look as close as possible like new and as good as other equipment listed on my site. 61. 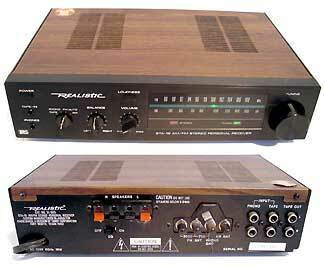 1980's Technics SA-424 Stereo Receiver: Digital tuner with analog and digital read out. 2 x 40W Phono, Aux and 2 Tape inputs. Expected price: $275 fully working. 62. 1970's Marantz 2230 Stereo Receiver: 2 x 30 W RMS. Phono, Aux and Tape inputs. Expected price: $549 fully working. 63. 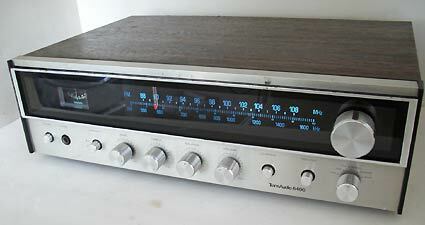 1970's Marantz 2245 Stereo Receiver: 2 x 45 W RMS. Phono, Aux and Tape inputs. Expected price: $649 fully working. 64. 1070's Pioneer SX-525 Silver Face Receiver. 2 Phono inputs, Aux and Tape inputs. 2 x 30 W RMS. Expected price: $445 fully working. 65. Pioneer SX-1000. Late 1960's Silver Face Receiver. 2 Phono inputs (2 x Mag. 1 x Ceramic), Aux and 2 Tape inputs ( 1 x Tape heads 1 x standrd). 2 x 35 W. Expected price: $455 fully working. 66. 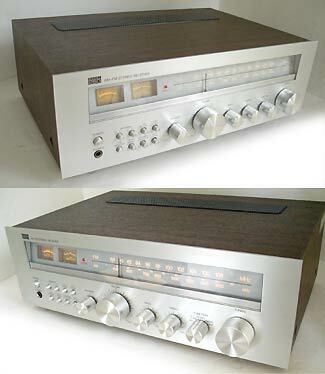 1970's Pioneer SX-1010 Silver Face "Monster" Stereo Receiver: 2 x 100 W RMS. Pioneers first "Monster" Receiver. 2 Phono, Aux and 2 Tape inputs. Expected price: $950 fully working . Please reference to above numbers!